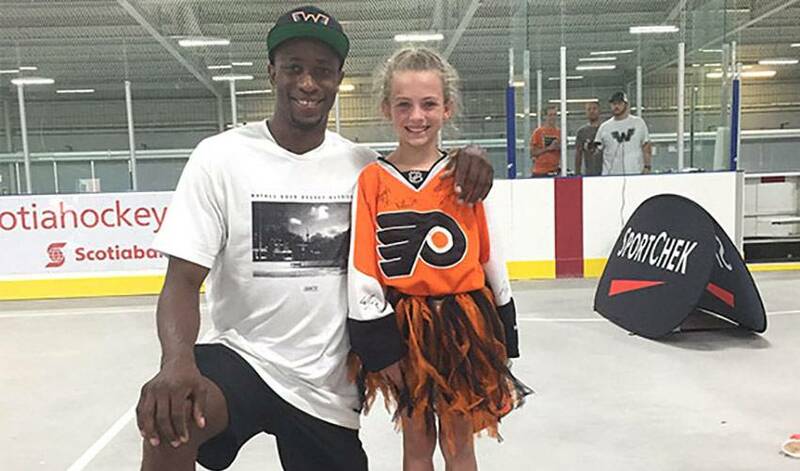 It was a day that brought out several familiar faces – parents, kids, sponsors and NHL players – and it also brought back cherished reminders of Simmonds’ time in Scarborough, ON, the place he grew up in. Over 150 kids came out to play alongside Simmonds and his NHL friends, including Darnell Nurse, Brayden Schenn, Mike Cammalleri, Chris Stewart, Anthony Stewart and Devante Smith-Pelly, who also took part in a celebrity game. Many of who come back each year. Prior to this year, Wayne’s Road Hockey Warriors has outfitted nearly 270 local youth with new hockey gear, along with covering their registration fees and equipment costs for close to 20 kids. Plenty has changed for him since he left his hometown for the NHL life. A veteran of 605 NHL regular season games, he wears an ‘A’ on his jersey as one of Philadelphia’s alternate captains and leaders. Simmonds is also coming off his best year offensively speaking, netting a career-best 32 goals in 2015-16. None of it, however, has stopped him from giving back. Not that he needed any reminders of that, but he did get a very meaningful one the day before his event. With Wayne Simmonds in their corner, the odds are definitely in their favour.